I know this is a lame question, but how do you post pictures here? Usually easiest to have 2 computer thangs open. P.S. Or get some 8yr old kid at the local elementary school to help you. Thanks to both of you for the info. Would like to post some pics of a old Logan deck that's driving me nuts. Looks like it was stained, and the very old Logan logo is brown, not black. Here is the link to the Logan Earth Ski thread in the Collectors Corner. Might be a good place to post up and ask related questions. Sounds like an exotic wood Logan deck. I know they made Teak decks, but I think they used other woods as well. Someone just posted a video on Skaters Over 50 Facebook group done by the Skateboarders Hall of Fame on Logan Earth Ski. I could not find the video on Youtube. They cover the exotic wood decks though. Use Mike's link to the Logan Collectors Corner thread. 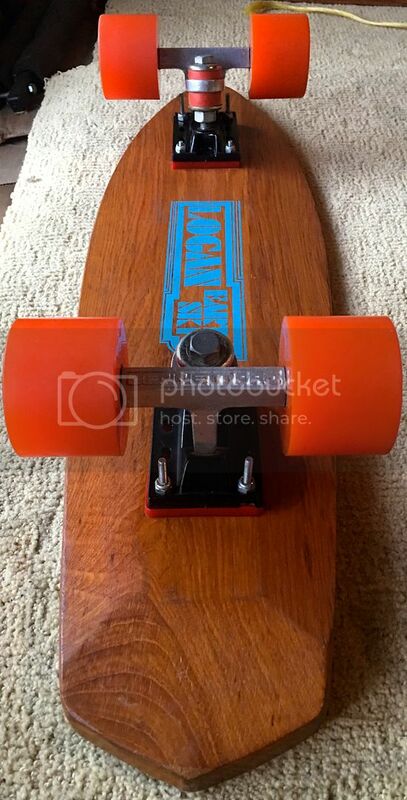 First post by skateboardpimp shows exotic wood decks. Exotic wood decks had blue lettering I believe. Thank you all for your help. I have teak. This is much older deck, it is 24 1/2, kick on it. The logo is Logan Earth Ski in brown letting. There is also a ridge on the bottom of the deck. Let mess around with photo bucket.